The Barn at 28 Main, Walpole, NH March 28th, 5:30 p.m. 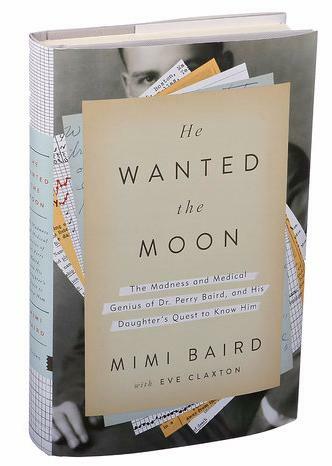 Author Mimi Baird will read an excerpt of her acclaimed book, He Wanted the Moon: The Madness and Medical Genius of Dr. Perry Baird, and His Daughter’s Quest to Know Him, at CYNTHIA-REEVES in Walpole, New Hampshire on March 28th at 5:30 p.m.
Dr. Perry Baird, Mimi’s father, vanished from her life when she was very young – no explanations were given as to why her father simply vanished. Fifty years later, while working as a manager at the Dartmouth-Hitchcock Medical Center, she received a box containing long-forgotten notes by Dr. Biard, a brilliant doctor, who documented the tortuous treatments he underwent for mental illness. Written in smudged pencil on onionskin paper, the box contained a memoir he had penned during these terrible months in his life. These writings prompted Ms. Baird to research her father’s journey through mental illness, and to bring his legacy to light. Dr. Baird was a Texas-born, Harvard trained physician who suffered from severe bipolar disorder – an illness that ultimately destroyed his life and scarred his family. Early in Dr. Baird’s medical career, he grew increasingly fascinated with identifying the biochemical root of manic depression, at a time when he began to manifest those very symptoms. By the time the results of his ground-breaking experiments were published, Dr. Baird had been institutionalized multiple times, his medical license revoked, and his wife and daughters estranged. He ultimately underwent a lobotomy and died from a consequent seizure, his research incomplete and his achievements unrecognized. He Wanted the Moon is the result of his extraordinary personal accounts and Ms. Baird’s efforts of many years to bring his name, and his testimonials, to light. It is an unforgettable testament to the reaches of the mind and the redeeming power of a determined heart. He Wanted the Moon is soon to be a major motion picture, produced by Brad Pitt and Pitt’s Plan B production company, with a screenplay by award-winning writer, Tony Kushner. This event is free and open to the public; refreshments will be served.